ex-Portsmouth (38 wagons and a brake van). have minimized or stopped the accident. up. Fortunately, although two guards were cut and bruised, no fatality or even serious injury resulted. loaded vehicles and brake van. Brighton road. The signal-boxes concerned are Earlswood Junction, on the south, and Quarry Intermediate, on the north. Worsted Green signal-box forms an additional block post by day time, but is switched out at night. is possible to see through it from end to end. 1. The statements of the men concerned in this case do not conflict on any point of importance. stood, with buffers closed, and that it was not necessary for him to use his hand brake to keep them in that position. deraiI the engine and some trucks of the Portsmouth train. atmosphere was so thick that neither he or his fireman (Mapp) was able to the funnel of their own engine. down past the engine, were unable to see so far as the end of the train. before he took action. He does not recall what happen after the collision, and was fortunate to escape serious injury. order to lay detonators on the down road, but without success, until the near approach of the down train forced him to desist. van but admits he did not see any side tail-light. Goods trains are distinguished by a tail lamp on each side of the brake van. of his signal-box obstructs the vision. 400 yards behind the engine. trucks, and not box vans, clearly show that he was not carrying out his duty of observation properly. 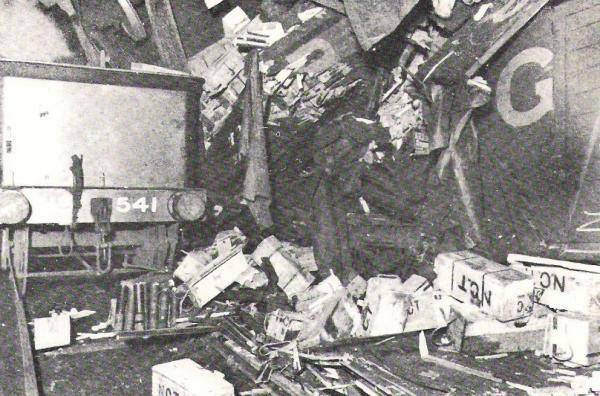 Portsmouth train before the collision occurred. hours respectively, and do not appear to have had excessive hours of duty during the preceding week. harbour, caught fire, and blew up wrecking the harbour and much of the town. Loco Sheds of Enginemen involved are not know at this moment.